Home /Alexandria Ocasio-Cortez to bankers: Kids go to jail, should more folks have gone to jail for the financial crisis? Alexandria Ocasio-Cortez to bankers: Kids go to jail, should more folks have gone to jail for the financial crisis? New York Congresswoman Alexandria Ocasio-Cortez hit out at the CEOs of some of America’s largest global banks questioning why, when her young constituents are jailed for jumping the subway, more individuals had not received custodial sentences for the role they played in the 2008 financial crisis. 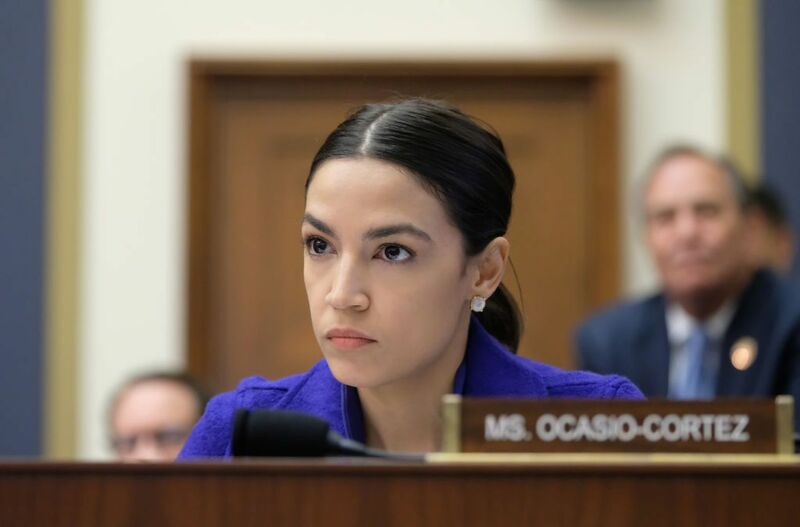 Ocasio-Cortez asked the questions during a House Financial Services Committee session on developments in the banking industry over the last decade, ten years on from the financial crisis. “In my district, I represent Rikers Island. I represent kids that go to jail for jumping a turnstile because they can’t afford a Metro card. Do you think more folks should have gone to jail for their role in a financial crisis that led to 7.8 million foreclosures in ten years between 2007 and 2016, Mr. Dimon?” the freshman Congresswoman quizzed JPMorgan Chase CEO Jamie Dimon. Ocasio-Cortez, who has quickly made a name for herself in her first months in Congress fighting vested interests and advancing a progressive Democratic agenda, opened her questioning by quoting a list of fines imposed upon the banking sector in recent years. “I am concerned here about the potentiality of fines, related to misconduct, just being a incorporated as the cost of doing business,” the New York representative said, referring to, among other fines and settlements, the $6.5 billion settlement Bank of America agreed to in 2014 for misconduct, through to a $25 million fine against Citi in March of this year. “Is a cost benefit analysis that weighs the cost of government fines versus the potential upside of potentially breaking the law, does that factor into controversial decision making around misconduct at your bank?” Ocasio-Cortez asked to a short answer of “absolutely not,” from Citibank CEO Michael Corbat. Dimon told the 29-year-old congresswoman that legal experts would have to answer whether more people should have gone to jail in the wake of the crisis. “Look you have to talk to a lot of legal experts about why more people didn’t, whether they deserve to, whether they broke the law, what’s intent, what’s not intent but you’d have to talk to legal experts about that,” the JPMorgan Chase CEO said. The CEOs of seven of America’s mega banks were present on Capitol Hill yesterday for extensive and at times tense questioning. The session “Holding Megabanks Accountable: A Review of Global Systemically Important Banks 10 years after the Financial Crisis,” strayed into questioning over inflated executive pay and how historically banks had benefited from the slave trade. “Do you believe your bank benefited from slavery?” Democrat Representative Al Green asked. According to the Washington Post, Dimon, whose bank in 2005 admitted to owning hundreds of slaves, said JPMorgan Chase had. The bank owned hundred of slaves and received thousands of slaves as collateral before the Civil War.